It all started last year when I had an insane idea to challenge myself to design 50 – 8″ blocks in 50 weeks. I also asked 50 guest bloggers to join me and together create a total of 100 new blocks for everyone to enjoy. Block designs would be drawn on the back of serviettes in a coffee shop or on scraps of paper when waiting to pick up the children from after school activities, then transferred into EQ7 for manipulation. The blocks were a menagerie of different techniques, using mainly fabrics from my scrap bin, with a traditional, modern/contemporary theme. When I could, I would show how the blocks would look in different settings and colour ways. The designs were based on things that were part of my everyday life as a stay at home mum running a small business. 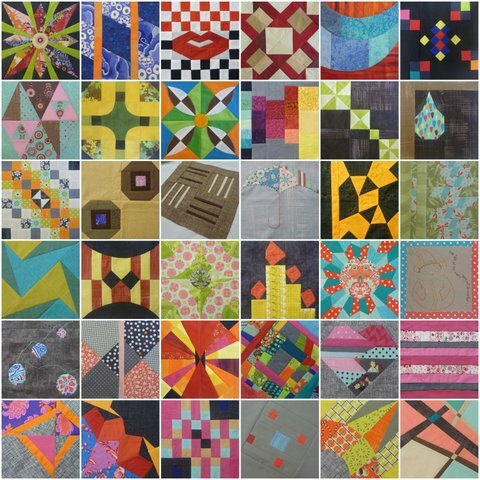 This was not a traditional quilt-a-long but a quilt-if-you-like-along, where the participant could pick and choose which blocks they would use in their projects. There are some blocks I really liked and one day will make quilts using the single block or a combination of a few. Hard to find good help these days. The boys were too impatient to let me straighten the quilt. This quilt is made using all the blocks. I chose the freeform look (laying it on the floor and cutting 3″ strips to be randomly placed around and between each block ) I chose greys, charcoals and a text print as a background filler to subdue the vibrant colours in the blocks. 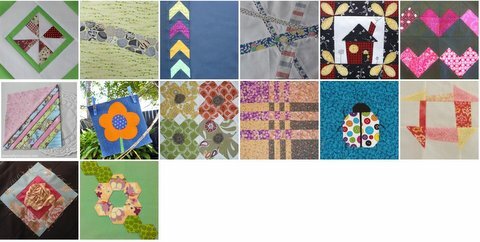 These blocks were never supposed to be made into one quilt, I just wanted to collate them into an ‘Album’ as a memento of the challenge. My dilemma will be how to quilt it! I hope those who visited my blog each week to view the blocks enjoyed it as much as I did making them. I am so appreciative of all the guests who made their wonderful blocks to share with us each week. Now on to some unfinished projects. Thanks for giving us so many wonderful blocks. I am not at all keen on paper foundation piecing, but one of your blocks tempted me into it anyway. That was a marathon! Congratulations on making it very successfully to the end! It's amazing Jane. I'm still a bit stunned how talented you are! Wow, what a wonderful collection. Wow, that looks fantastic. 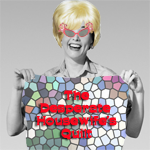 Are you thinking of an overall design when quilting? 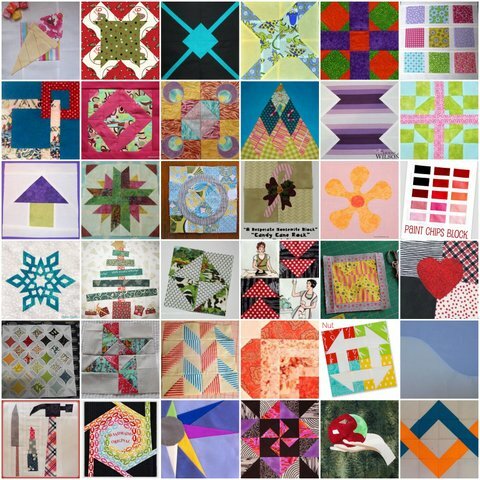 Or do you think you will quilt each individual block? Good luck. WoW! Tons of talent! Lots of great blocks and what a neat challenge. I think your quilt looks great. i had lots of fun following your blocks and the guests. Thanks for all the hard work you all put in. I have had fun learning new blocks. So interesting that the blocks are all so different but you have managed to tie them together so well. Simply stunning! Amazing work!!!! There are quite a few I want to make. 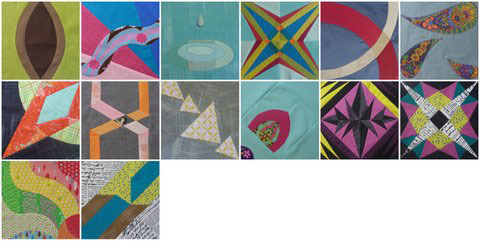 Thank you (and the other quilters) so much for sharing what your creative minds have conjured.